So far in discussing resonance forms we’ve mentioned two important principles that govern which resonance form will be most important. 1. 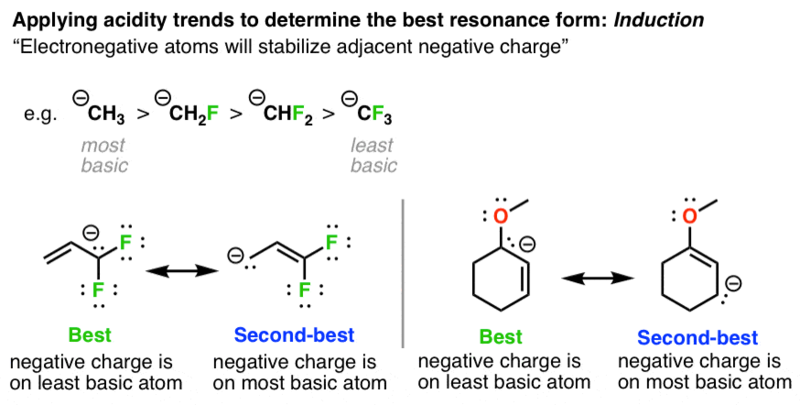 Minimize total point charges: the resonance form with the fewest charges will be the most important. (which is OK think of as “most stable”, even if resonance forms don’t actually exist). 2. How to break π bonds. If you absolutely must break a π bond to make a resonance form, dit is best to do it in a way so that the pair of electrons end up on the more electronegative atom of the π bond. All else being equal, a resonance form with a negative charge on a less basic atom will be more important than a negative charge on a more basic atom. You could argue that this definition is circular, because basicity is essentially a measure of the stability of an anion. OK, fine. The more stable an anion is, the less basic it is. So how do we go about finding out information on basicity? My suggestion is to visit your best friend, the pKa table. Or you could familiarize yourself with the key trends that affect acidity, and apply these concepts to resonance forms. Let’s go these trends them one by one. Recall that basicity decreases as the electronegativity of an atom increases. That means that in comparing two resonance forms of equal charge, we can determine which is more stable by examining the electronegativity. In the examples above, we can tell that the resonance forms on the left are more stable than the resonance forms on the right, since the electronegativity of O > N and also O > C. There are a lot of chemical structures that have resonance forms with alternating charges on C and N (or O), so this is a particularly useful rule. The basicity of an atom decreases as the polarizability increases. This trend especially applies for atoms in the same column of the periodic table, such as O and S.
But it ain’t always straightforward. Organic chemistry being what it is, it’s common to have situations where we have to weigh the effects of multiple variables. Like in these examples. What do we do here? We rely on experimental results. One body of work in this area is the pKa table, an experimentally derived guide to the multi-variable dependent phenomenon of acidity. Another is to compute the relative energies computationally. Or, a third is simply to apply the 4 principles we’ve discussed earlier to the situation at hand and see which act in the same direction and which oppose. At least 3 of the examples here should be fairly straightforward to figure out . So to make a long story short, as I’ve said many times before, the pKa table is your friend. For three good reasons. 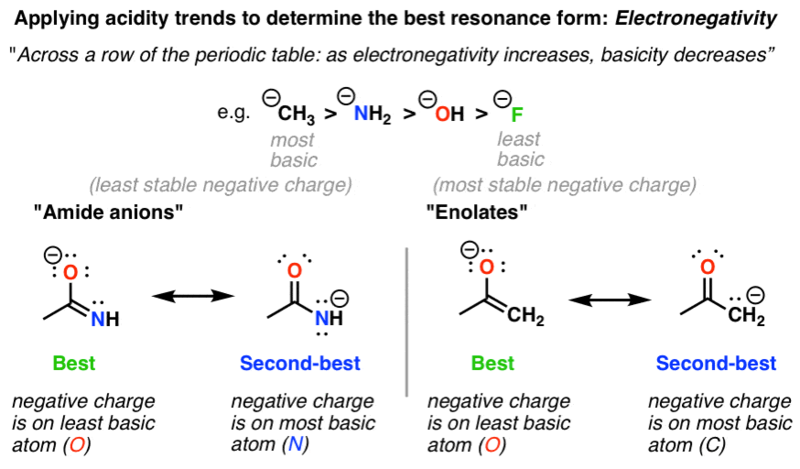 Next Post: Evaluating Resonance Forms (4): Where to put the positive charges? [Note 1] . it should also be pointed out that theres going to be some repulsion in charge between the oxygen & negative charge or the fluorines & negative charge. Furthermore once the electron withdrawing group can participate in resonance we have to think about π donation and π accepting. Note 2: What about hybridization? Doesn’t that affect stability of negative charges too? After all, the reason why alkynes are more acidic than alkenes which are more acidic than alkanes is because the ability of orbitals to stabilize negative charge increases as increase the amount of s character [sp3 to sp2 to sp ]. So shouldn’t that apply, for example, in the instance below? From examining these two resonance forms we might be tempted to believe that the nitrogen on the left (the one bearing a hydrogen) is sp2 in one version and sp3 in another. If you think about what resonance forms represent, however – different ways of depicting electron density – you will realize that this can not actually the case since that would involve moving atoms around [re-hybridizing from sp2 (trigonal planar) to sp3 (tetrahedral). ]. Both nitrogen atoms are, in fact, sp2 hybridized, and their stabilities cannot be distinguished based on this characteristic. [Thank you to reader Brian E. for correcting an earlier version of this post. In fact, Brian informs me that calculations indicate the right-hand resonance form makes a significantly higher contribution to the resonance hybrid than does the left-hand resonance form]. Shouldn’t there also be a positive charge in the diazo structure, namely on the nitrogen attached to carbon? yes,there should be a positive charge there. Which is the more stable resonance structure in that case the left side ones for diazo,thiocyanates,cyanates and nitrile? In the multivariables which one is the best or more stable resonance form the left or right structure? Diazomethane CH2=N+=N- conforms to the right hand structure. Is it correct to say that because the compound has that structure the diazo anion is less stable than the triple bonded structure? “Cyanates” – left. ‘Nitriles” – right. “Diazo” – right. “Thiocyanates” – left. In the examples under multivariables in play which is the more stable resonance structure left or right side one? Also in the nitrile the right side structure looks more stable with negative charge on nitrogen and in the left hand structure negative charge on more basic sp3 carbon. Then why isn’t right structure more stable than left hand one? However for the Diazonium salts the structure is Ar-N+=(triple bond)NCl- Benzenediazonium Chloride. Any comments on that as it follows the left hand structure. I feel the triple bond structure ie Lhs structure for diazo is more stable since the resonance structure to the right should be correctly depicted as C(-)–N=N(+). In that case Lhs structure is more stable due to greater number of bonds. And in case of aryl diazo salts the stabler cation shall be Ar – N+triple bond N. in any case alkyl diazo salts are unstable like Diazomethane because of presence of charges. Hence with correct right resonance structure the left structure is stabler forming aryl Diazonium ion and corresponding salts. Trust this is the correct explanation of the phenomenon. Incorrect. The structure C(-)-N=N(+) that the comment suggests would have less than a full octet on the terminal nitrogen, which is extremely unstable. The diazo resonance form C=N=N(-) makes a very significant contribution, indeed the major one, which distinguishes it from ARYL diazo salts,in which only the triple-bonded nitrogen form [“diazonium”] is significant. The physical properties of alkyl diazo compounds differ considerably from that of aryl diazonium salts – ethyl diazo acetate for example is a liquid that can be (carefully) distilled, whereas one would be extremely foolish to heat an aryl diazonium salt (let alone an alkyl diazonium salt). Diazomethane is not an alkyl diazonium salt. It only becomes one once protonated, whereby it readily loses nitrogen. Thanks for your response. What I meant to say was that C(-)-N=N(+) is the more unstable form of the Diazonium ion that has a resonance structure with the triple bonded one in which the latter predominates. Aqueous solution of these Diazonium ions have sufficient stability between 0-10 deg C that may be used as intermediates in a variety of Nucleophilic substitution reactions. For instance if water is the only nucleophile available for reaction phenols are formed in good yield. So by way of comparison in the same aryl group where Diazonium salts find mention in literature I thought of the structure comparison as the correct way to look at it. As an aside I am highly appreciative of your initiatives for rendering very useful insights into the rather complicated field of organic chemistry as well as your prompt responses to any debates that may arise in understanding the subtle nuances in conceptual thinking which nevertheless enriches the learning process in a significant way. Please keep it up! Look at the figure drawn. Is there an aromatic ring drawn anywhere? No. It is an isopropyl group. If an aromatic group was there, then, yes, the diazonium form would be more stable, because the diazo form disrupts aromaticity. But an aromatic group is NOT drawn. It is an alkyl diazo compound. Very different. I don’t understand why aromatic rings are being brought up in this discussion. 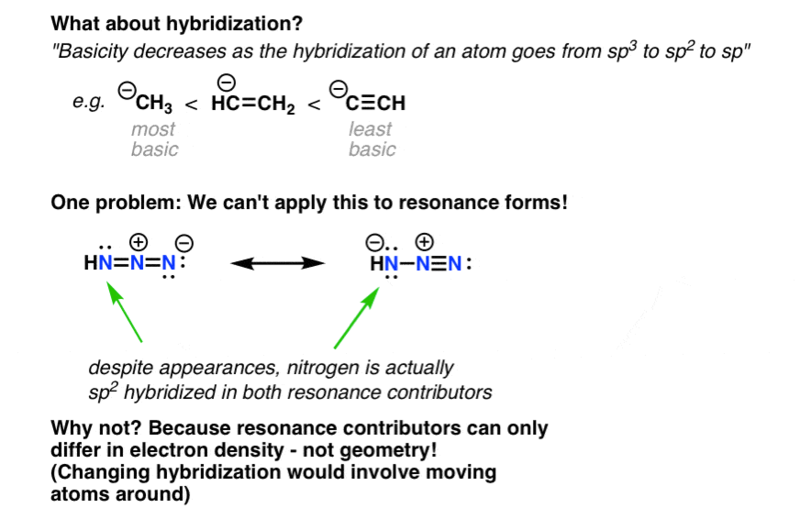 In the bottom example why is the nitrogen on the right considered to be sp2 when the Hybridization rule is Number of attached atoms (2 in this case, hydrogen and nitrogen) and 2 lone pairs. 2 plus 2 is 4 orbitals or sp3?